It's really hard to find ways to save on your Thanksgiving dinner because, let's face it -- It doesn't get a whole lot cheaper than a turkey dinner! Still, I have found some ways that you can save and today I'll pass them on to you! For starters, the larger turkeys are usually cheaper, so buy the largest one you can. I hear some of you groaning now about what to do with all those leftovers because you really don't need a 22 lb. turkey for 6 people. Not to worry -- just don't bake the whole thing. I discovered one year by accident that my butcher (at a regular national chain grocery store) would cut it in half for me. Even if it is frozen he can still do it. This discovery really changed my life. (That sounds dramatic, but I was really having a problem becoming "one" with my turkeys.) I suddenly had the revelation that I didn't have to deal with mounds of leftover turkey that haunted my post Thanksgiving menu for years. I had just enough for a good old turkey sandwich and some soup. I mean Thanksgiving really isn't Thanksgiving without a few leftovers, is it? It was so much easier to handle and prepare an 11 lb. turkey rather than to man handle a 22 lb. one. Getting it cleaned and into the pan was a breeze and in and out of the oven was just plain simple. Just wrap the other half and freeze it to use for Christmas. I've often made ham for Christmas just because by Christmas we are so sick of turkey that we don't want to think of preparing another one -- ever! By not creating so many leftovers, your family might not mind having turkey again. That's also potentially one less thing to buy for Christmas dinner. Another way to save is by making your own pies instead of buying the expensive pre-made ones. If you are daunted by the thought of making pie crust, just buy a ready made one. They are usually on sale for very little around Thanksgiving. It really isn't that hard to make the filling for most pies. Often they are easier to make than a cake or cookies. If you like the traditional pumpkin pie, most cans have the recipe on the back. If your family and friends aren't fussy about having the traditional, then you can make banana cream, chocolate, or butterscotch pie. Just take a box of banana pudding, mix it up and pour it into a baked pie crust. Cover with sliced bananas and whipped topping. For the chocolate pie use chocolate pudding with chocolate chips in it and cover it with whipped topping. For the butterscotch use butterscotch pudding, whipped topping and sprinkle with butterscotch chips. My mouth is watering just thinking about it! You also don't have to make so many pies that you could open a bakery. I have found that most kids are just as happy with a platter of cookies. Don't overdo it. You'll just wear yourself out! If you have time, make the cookies in the shapes of pumpkins and turkeys. Save on your relish dish. Buying ingredients for a relish dish can get expensive, especially where we live. One year I paid more for my relish dish items than my turkey. If you're having this problem, only use 3-4 veggies on it instead of 10 and cut out on the more expensive veggies. For example broccoli and cauliflower are very high priced for us so I would probably use carrots and celery. I fill the celery with cheese or peanut butter or cut them into fancy shapes. 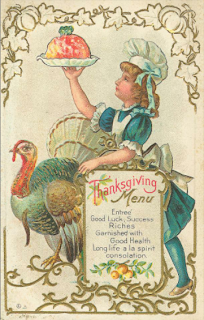 On this occasion, the turkey is the star and most people won't even notice that you cut back on the relish dish. Don't make so many side dishes-- Like I said the turkey, gravy and mashed potatoes are above all else. By the time everyone stuffs themselves on those, they only eat a token amount of the side dishes. Why? ---Because of course everyone wants to save room for dessert!